WASHINGTON, D.C. -- Americans continue to cite dissatisfaction with government above all others as the United States' top problem, even as recent events have resulted in a reshuffling of other issues. Healthcare has fallen precipitously on the list since Congress failed to pass legislation to reform the Affordable Care Act, and Americans' mentions of race relations and immigration have edged up. With Hurricanes Harvey and Irma front-of-mind, natural disaster relief made an appearance on the list. Most Important Problems Facing the U.S.
Issues mentioned by 4% or more of respondents in September 2017 are shown. The latest results are from a Gallup poll conducted Sept. 6-10. This poll follows an eventful month since Americans were last asked to name the country's most important problem in early August. Racial tensions rose across the U.S. in August after a violent neo-Nazi rally in Charlottesville, Virginia. Later, the Trump administration's announcement that it will end the Deferred Action for Childhood Arrivals (DACA) program, which protects 800,000 immigrants who were brought to the U.S. illegally as children, was bookended by two destructive hurricanes that hit the U.S. (Irma, the second hurricane, occurred while the latest poll was being conducted). Each of these events resulted in at least a slight increase in the corresponding issue's position on the nation's "most important problem" list. Despite an increase in U.S.-North Korea tensions in August after further nuclear weapons testing by Kim Jong Un, there was little change this month in the percentage of Americans citing the situation with North Korea as the nation's top problem. Six percent now mention it, compared with 4% in each of the prior two months. Healthcare, which had ranked high on the list of most important problems for the previous two months, has fallen from 17% in August to 6% this month after Republicans' failure to repeal Obamacare faded from the news. Yet, dissatisfaction with government remains at the top of the list. Unlike some of the mercurial issues that change with current events, dissatisfaction with government is a persistent problem in Americans' minds. It has been near or above 20% since shortly after Donald Trump's inauguration and is driven more by Democrats than Republicans. 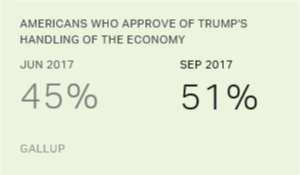 Although U.S. adults continue to harbor some economic concerns, the percentage of Americans naming at least one economic issue -- what Gallup calls "net economic mentions" -- is now 17%, the lowest since July 2007. This net reading encompasses numerous economic issues, including -- but not limited to -- unemployment, taxes, the gap between rich and poor, the federal budget deficit and any general mentions of the economy. Recently, there have been fewer mentions of unemployment and the economy in general, and this is an important determinant of the gradual decline in the overall net economy figure. 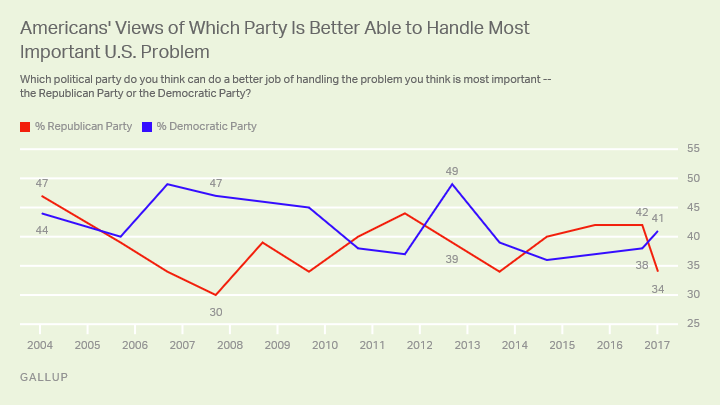 In this survey, Americans were asked to indicate whether the Republican Party or the Democratic Party can do a better job of handling the problem they named as most important. The results show the Democratic Party holds a seven-percentage-point advantage over the Republican Party, 41% to 34%, among all U.S. adults. Seventy-nine percent of Republicans choose their own party while 86% of Democrats choose theirs, and roughly one in 10 of each party's loyalists don't think it makes a difference. Gallup has asked this question consistently every September since 2004, with mixed responses. In 2016, Republicans edged out Democrats as the best party to handle the most important problem, and Trump won the presidency. In 2012, Democrats held the advantage and Barack Obama was re-elected. But in September 2011, more than a year before the presidential election, Republicans held a seven-point lead over Democrats. Likewise, in September 2013, Democrats held a five-point lead over Republicans, but in the midterm elections more than a year later, Republicans made big gains. 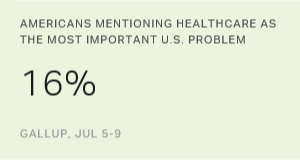 As Americans continue to be relatively positive about the economy and as the healthcare debate has been tabled for the time being, other problems have moved up the most important problem list, although no single issue gets more than 18% of mentions. Historically, this list has changed along with current events, and this month is further proof of that. Still, Americans' consistent view is that government itself -- including the president and Congress -- sits at or near the top of the list. With more than a year to go until the 2018 midterm elections, the Democratic Party has a perceived edge over the Republican Party as to which can better handle the nation's top problems. But given the history of this question, this should not be interpreted as predictive of how those elections will turn out. As the Senate considers repealing the Affordable Care Act, more Americans name healthcare as the most important problem facing the U.S.